Birmingham-raised writer Kit de Waal published her first novel in 2016, aged 55. She used part of the advance to set up a scholarship in an attempt to improve working-class representation in the arts. She talks to writers, agents and publishers about barriers for writers from working-class backgrounds. This is an issues that the great British comics writer, Pat Mills, raised in some of the interviews I posted up on here. Mills, who created the classic anti-war strip, Charley’s War, and wrote and created many of the classic characters in the SF comic, 2000 AD, has said that he felt angry that there were no working class characters in comics and very few in mainstream literature. Worse, there was an attitude amongst the media that was determined to exclude them. He has described how he was working on a story for Dr. Who in the 1980s, which was to have a working-class spaceship captain. This was rejected by the script editor, who really didn’t like the idea. As for popular music, I was told by a friend of mine a little while ago that this was another traditional working class area that was being taken over by the middle classes. Most of the stars now in the charts, or at least at the time, were graduates of university courses in music or the performing arts. The pub rock scene, which emerged in the ’70s and which the launched the careers of many of the great working class bands of the ’70s and ’80s is now very much disappearing. Once upon a time, back in the 1980s and 1990s, Private Eye’s literary column took a somewhat similar view of the contemporary literary scene. The reviewer back then was acutely critical of the snobbishness and cliquishness of literature and the publishing industry. The Eye believed and very strongly argued that British literature was dominated by a small clique of writers, who were largely vastly overhyped, to the exclusion of better writers and aspiring authors, who were rejected out of hand. They gave as an example of this a conversation they’d heard about with one of the editors of Granta. When the editor was asked about a piece submitted by one aspiring author, they responded by asking what colour the enveloped it was send in was. This, the Eye’s reviewer went on, showed precisely what the attitude towards outside submissions at the magazine was. It was geared entirely towards people within the literary clique. Those outside were automatically rejected, manuscript unread. The Eye wasn’t particularly interested in the class aspects of this question. Which isn’t surprising, as Richard Ingrams, the former editor pointed out during a talk one year at the Cheltenham Literary Festival that the magazine’s founders – himself, Willie Rushton, Peter Cook and so on, were all middle-class and privately educated. The Eye’s reviewer said several times that there was no reason why working class writers should be particularly promoted over others. They also made the occasional sneering comments directed at left-wing authors stressing their very working class roots that they were ‘prolier than thou’. I think they may even have made a comment about ‘Prole-lit’ for a type of very stereotypical ‘working class’ literature. But they also attacked authors, who seemed to be published solely on snob value, because they were members of the aristocracy or the upper-middle classes, rather than because their writing had any intrinsic merit. Regarding one such author, the Eye’s reviewer said that any miner, who ever picked up a pen to write a sonnet, was of far more interest and value than them. They also savaged authors from the upper classes, who struck them as having a particularly patronising attitude to the lower orders, who read her books. There’s one review, which takes Jilly Cooper to task for this, whether the reviewer writing as her, sends her up by describing her readers as ‘pawps’ as an example of the class snobbishness in her novels. I’ve never read Cooper, so can’t really say whether this attitude is entirely fair or not, or, if it is, whether Cooper is any worse than many other authors. I think that in more recent years the Eye’s literary column lost a little of that fierce opposition to the cliquishness of the literary scene, and particularly the London literary milieu. It still attacks and parodies overhyped, bad writing, but this seems part of a simple attack on overrated, mediocre literature. This now includes the works of the stars of reality TV shows and vapid, but inexplicably popular, bloggers and vloggers on the Net. But working class representation in writing, and other areas of the arts is a genuine part of the wider issues of access and exclusivity. Whether the Net will have an impact here, in popularising the work of working class writers, who would otherwise remain unpublished if left to the world of traditional literary agents and publishers, remains to be seen. This comes from the Socialist Workers’ Party, an organization of which I am not a member and which I don’t support. But this is another really great video, in which one of the great creators of the British comics for over forty years talks about politics, social class, the role of capitalism and women and feminism, not just in 2000AD, but also in comics and publishing generally, and the media. Mills was speaking as part of annual four day convention the Socialist Workers hold on Marxism. Simic introduces himself as the person, who gets the annual geek slot. As well as a member of the party, he’s also a convener of USDAW. And he’s very happy in this, the centenary of the Russian Revolution, to have on Pat Mills. Mills starts by saying that as he was growing up in the 50s and 60s, he read the same books everyone else did – John Buchan, Ian Fleming, Dennis Wheatley, Sherlock Holmes and the Scarlet Pimpernel. But there was something about it that made him angry, and it was only looking back on it that he came to realise that what infuriated him was the fact that these were all authors from the upper and middle classes, who created heroes from those class backgrounds. He makes the point that these were good writers, but that some of their work was very sinister the more you go into it. Like John Buchan. Buchan was the major propagandist of the First World War. Mills says that Alistair Campbell, Tony Blair’s infamous spin doctor, had nothing on him. He promoted the First world War, for which he was rewarded with the governorship of Canada. He states that he doesn’t want to go too far into it as he’ll start ranting. Nevertheless, he’s glad to be able to talk to the people at the SWP’s convention, as it means they have a similar opinion to him, and he doesn’t have to censor himself. He makes the point that there are very, very few working class heroes, and believes this is quite deliberate. It’s to deprive working people of a strong role. When the working people do appear, it’s as loyal batmen, or sidekicks, and there is an element of parody there. And it’s not just in comics and literature. In the 1980s he was contacted by the producers of Dr. Who to do a story. He wanted to have a working class spaceship captain. He was told by the script editor that they couldn’t. They also didn’t like his idea to have a working class family. It was only by looking back on where this hatred of the heroes of traditional literature came from, that he came to realise that it wasn’t just that he didn’t want to have any generals in his work. He also talks about how it’s easier to get away with subversion in comics, as comics are treated as a trivial form of literature, which nobody really cares about. The profit motive also helps. So long as it’s making money, comics companies don’t care what’s going on. And this explains how he was able to get away with some of the things he did in Battle. He states that the way he works is by pretending to write something mainstream and inoffensive, and then subvert it from within. An example of that is Charley’s War in Battle. This looks like an ordinary war strip, but in fact was very anti-war. Even so, there were times when he had to be careful and know when to give up. One of these was about a story he wanted to run about the entry of the Americans into the War. In this story, a group of White American squaddies are members of the Klan, and try to lynch a Black soldier. Charley wades in to help the Black guy. The management rejected the story on the grounds that they didn’t want anything too controversial. Mills decided to draw in his horns and bite his tongue at that point, because he had a bigger story lined up about the British invasion of Russian in 1919, when we sent in 20-30,000 men. It was, he says, our Vietnam, and has been whitewashed out of the history books. He also makes the point that subversion was also present in the girls’ comics. Even more so, as there was a psychological angle that wasn’t present in the boys’. For example, there was one story called ‘Ella in Easy Street’, where a young girl reacts against her aspirational family. They want to get on, and so the father has two jobs, and the mother is similarly working very hard to support their aspirations. But Ella herself is unhappy, as it’s destroying what they are as a family. And so she sets out to sabotage their yuppie dream. Mills says that it’s not all one-dimensional – he looks at the situation from both sides, pro and con, but the story makes the point that there are things that are more important that materialism and social advancement, like family, comradeship. He says that such a story could not be published now. It’s rather like The Loneliness of the Long Distance Runner, where the hero, in the end, throws the race as a way of giving the system the finger. Mills reminds his audience just how massive girls’ comics were in the ’70s. They were bigger, much bigger, than the boys’. 2000AD sold 200,000 copies a week in its prime. But Tammy, one of the girls’ comics, sold 260,000. This is really surprising, as women read much more than we men. These comics have all disappeared. This, he says, is because the boys’ took over the sandpit. He has been trying to revive them, and so a couple of stories from Misty have been republished in an album. This gets him onto the issue of reaching the audience, who really need it. In the case of the stories from Misty, this has meant that there are two serials on sale, both of which are very good, but in a book costing £17 – odd. The only people going to read that are the mothers of the present generation of girls, perhaps. To reach the girls, it needs to be set at a lower price they can afford. This is also a problem with the political material. If you write something subversive, it will receive glowing reviews but be bought by people, who already agree with you. He wants his message to get further out, and not to become a coffee table book for north London. He talks about the way British comics have grown up with their readership, and the advantages and disadvantages this has brought. British comics has, with the exception of 2000AD, more or less disappeared, and the readership of that comic is in its 30s and 40s. People have put this down to demographics and the rise of computer games, saying that this was inevitable. It wasn’t. It was our fault, says Mills. We fumbled it. Games workshop still have young people amongst their audience, while the French also have computer games across the Channel, but their children are reading comics. Mills goes on to say that it’s easier writing for adults. Writing for 9 and 10 year olds is much harder, because if they don’t like a story, they’ll say. He says to his audience that they may think the same way, but they’re much too polite to say it at conventions. And they had to respond to their young readers as well, as the kids voted on it every week. They’d tell you if they thought it was a bad story, even if you thought it was the best one so far, and asked yourself what was wrong with the little sh*ts. He also talks about how difficult it is to break into comics. He has friends, who have been trying for decades to get into 2000AD, and have been unsuccessful. His advice to people trying to do so is: don’t bother. There’s nothing wrong with you, it’s 2000AD. And this also effects text publishing. All the publishers have now been bought up, so that HarperCollins have the fingers in everything, such as Hodder and Stoughton. And their politics aren’t ours. The way round this is to get into web publishing. Here he digresses and talks about pulp fiction, which is a close relative of comics. He was talking to a guy at a convention, who writes pulp fiction and puts it on the net. It only costs a few pence. The man writes about a zombie apocalypse, but – and this is true, as he’s seen the payment slips – he’s pulling in £3,000 a month. Mills says that this is important as well. He wants to get his material out there, but he also wants to eat. This shows you how you can make money publishing it yourself. Later on in the video, after the questions and the comments from the audience, he goes further into this. He mentions some of the web publishers, one of which is subsidiary of Amazon, which will allow people to publish their own work. He also talks about self-publishing and chapbooks. He found out about these while writing Defoe, his story about Leveller zombie killer in an alternative 17th century England. Chapbooks were so called because they were cheap books, the cheap literature of the masses. And this is what comics should go back to. He says that everyone should produce comics, in the same way that everyone can also make music by picking up an instrument and playing a few chords. He also praises some of the other subversive literature people have self-produced. Like one piece satirizing the British army’s recruitment posters. ‘Join the army’, it says, ‘- like prison, but with more fighting’. Mills is fairly sure he knows who wrote that as well. It was another guy he met at a convention, who was probably responsible for the anti-war film on YouTube Action Man: Battlefield Casualties. He enormously admires this film, and is envious of the people, who made it. He also talks about some of the fan letters he’s had. One was from the CEO of a school, he talks about the way reading 2000AD opened up his mind and changed his moral compass. The man says that everything he learned about Fascism, he learned from Judge Dredd, everything about racism from Strontium Dog, and feminism from Halo Jones. He and his headmaster, whom he names, were both punks and he’s now opened a school in Doncaster. The most subversive thing you can do now is to try to create an open-minded and questioning generation of young people. The letter is signed, yours, from a company director, but not an evil one, and then the gentleman’s name. He concludes this part of the talk by describing the career of James Clarke, a member of the Socialist Labour Party, the Communist Party, a lion tamer and conscientious objector. During the War he ran escape lines for British squaddies in France. And people say that pacifists are cowards, Mills jokes. How much braver can you be than sticking your head in a lion’s mouth. He wrote a pamphlet defending a group of comrades, who tried to start the revolution by following the example of the Irish Nationalists and blow things up with a bomb. The pamphlet argued that this was wrong, and that if the working class wanted to gain power, they should concentrate on confronting capitalism through direct action. He also wrote poetry. Mills describes Clark as being a kind of Scots Tom Baker. One of these is a biting satire of Kipling’s If. The poem begins by asking if the reader can wake up every morning at 5 O’clock, or 4.30, and then labour at their machines, and see their wives and children suffer deprivation while those, who haven’t earned it take it all the profits, and describes the backbreaking grind of hard working life for the capitalist class in several stanzas. It ends with the statement that if you can do all that, and still be complacent, then go out, buy a gun and blow your brains out. Clearly, I don’t recommend any actually do this, but it is a witty and funny response to Kipling’s poem. I found it hugely funny, and I do think it’s a great response to what was voted Britain’s favourite poem by the Beeb’s viewers and readers a few years ago. Can you imagine the sheer Tory rage that would erupt if someone dared to recite it on television! Many of the comments are from people thanking Mills for opening their eyes and for writing such great stories. They include a man, who describes how Mills’ works are on his shelf next to his copy of Das Kapital. Another man describes how he used to buy 2000AD just after going to church on Sunday. So after listening to some very boring sermons, he came back from Baptist chapel to read all this subversion. One young woman says that the zines – the small press magazines, that appeared in the 1990s – seem to be still around, as she has seen them at punk concerts. Another young woman says that although comics are seen as a boys’ thing, when she goes into Forbidden Planet near her, there are always three girls in there and two boys. She also talks about how many young women read Japanese manga. Mills states in reply that manga stories generally are light and frothy, and so not the kind of stories he wants to write. But as for women in comics, he says that he spoken several times to students on graphic novel courses, and each time about 75 per cent of them have been women, which is good. He also talks about Crisis and Action. The Third World War strip in Crisis was about the politics of food, and was set in a world where food production was dominated by a vast multinational formed by the merger of two of today’s megacorporations. Mills states that when the strip covered what was going on in South America, that was acceptable. However, at one point he moved the story to Brixton, finding a Black co-writer to help with the story. At that point, the White Guardian-reading liberals started to be uncomfortable with it. There was also a story in which Britain leaves the EU. This results in the rise of a Fascist dictatorship, and the EU responds by invading Britain. Mills says that he’s been trying to get Crisis relaunched, but the company are stringing him along with excuses, probably because it’s easier than arguing with him. Mills obviously did the right thing by finding a Black co-writer. Marvel suffered a barrage of criticism with some of their attempts to launch a series of Black superheroes, like the Black Panther as part of the Blaxploitation wave of the 1970s. The Black Panther was particularly criticized. The creators were old, White dudes, who didn’t understand urban Black culture, even if the comics themselves were sincere in presenting a sympathetic view of Black Americans and combating racism. He also talks briefly about Action, and the controversy that caused. What really upset Mary Whitehouse and the rest was ‘Kid’s Rule UK’, a strip in which a disease killed everyone over 16, and Britain was inhabited solely by warring street gangs. Mills used to take the same train from where he was living at the time with Mary Whitehouse. He said he was editing a Hookjaw script at the time, and notice Whitehouse over the other side of the carriage looking daggers at him. So he put in more carnage and more arms and legs being bitten off. One of the most interesting questions is about the politics and morality of Judge Dredd. Dredd is a fascist, and in one of the strips it seemed to take the side of authority over subversion with no irony. This was in a story about the punks taking over Megacity 1. At the end of the strip, Dredd gets hold of the leader, and makes him say, ‘I’m a dirty punk.’ Mills actually agrees with the speaker, and says that there are people, who take Dredd as a role-model. He’s had letters from them, which he doesn’t like. He doesn’t know what these people do. Perhaps they have their own chapterhouse somewhere. He went cold inside when he heard about the story. It wasn’t one of his. It was by John Wagner, who isn’t at all political, but is very cynical, so this has some of the same effects of politics. But 75 per cent of Dredd comes from Mills. Mills states that it’s a flawed character, and that can be seen in why the two Dredd films never did well at the box office. Dredd was based on a particular teacher at his old school, as was Torquemada, the Grand Master of Termight, a genocidally racist Fascist military feudal order ruling Earth thousands of years in the future. They were both two sides of the same coin. That was why he enjoyed humiliating Torquemada. But it isn’t done with Dredd. Yet it could have been different, and there could be instances where people have their revenge on Dredd without losing the power of the character. He states that it was because Chopper did this in the story ‘Unamerican Graffiti’, that this became the favourite Dredd story of all time. It’s a fascinating insight into the politics of the comics industry. The zines and other self-published small magazines he describes were a product of the Punk scene, where people did start putting together their own fanzines in their bedrooms. It was part of the mass creativity that punk at its height unleashed. As for the web comics, he talks about a couple that he finds particularly impressive, including those by the author of the dystopian science fiction story Y – the Last Man, set in a future in which all the men in the world have been killed by another disease. A number of my friends used to publish their own small press magazines in the 1990s, as did Mike. Mike started his own, small press comic, Violent, as an homage to Action when it was that comics anniversary. Mike was helped by some of the artists and writers from 2000AD, and so some of the tales are very professional. But probably not for delicate, gentle souls. Amongst SF fandom, chapbooks are small books which another publishes himself. And they have been the route some professionally published authors have taken into print. Stephen Baxter is one of them. I think his Xelee stories first appeared in a chapbook he sold at one of the SF conventions. Looking back at Kids Rule UK, this was my least favourite strip in Action. I was bullied at school, and so the idea of a Britain, where everything had broken down and there was nothing but bullying and juvenile violence really scared me. Action took many of its strips from the popular culture of the time. Hookjaw was basically Jaws. One-Eyed Jack seemed based very much on the type of hard-boiled American cop shows, if not actually Dirty Harry. One of the SF movies of the late sixties was about an America in which teenagers had seized power, and put all the adults in concentration camps were they were force-fed LSD. One of the four Star Trek stories that were banned on British television until the 1980s was ‘Miri’. In this tale, Kirk, Spock and the others beam down to a planet occupied entirely by children, as all the ‘grups’ – the adults – have been killed by disease. Kids Rule UK seems very much in the same vein as these stories. Mills’ story about Dr. Who not wanting to show a working class family, let alone a spaceship captain, shows how far the series has come when it was relaunched by Russell T. Davis. Christopher Eccleston basically played the Doctor as northern and working class, wile Rose Tyler’s family and friends were ordinary people in a London tower block. As for not wanting to show a working class spaceship captain, that probably comes from very ingrained class attitudes in the aviation industry. A friend of mine trained as a pilot. When he was studying, their tutor told the class that the British exam included a question no other country in the world required, and which was particularly difficult. He stated that it was put there to weed out people from working or lower middle class backgrounds, as they would fail and not be able to retake the exam, as their competitors from the upper classes could. It’s great to hear Mills encourage people try to produce their own work, and not be disheartened if they are rejected by mainstream publishers. I’m also saddened by the absence of any comics for children. They offered me when I was a lad an escape into a whole world of fun and imagination. And at their best, they do encourage children to take an interest in real issues like racism, sexism, bigotry and exploitation. I hope some way can be found to reverse their disappearance. Zionism: The Real Enemy of the Jews, Vol. 1, Alan Hart (Kent: World Focus Publishing 2005). has a unique experience of the Arab-Israeli conflict in both its regional and global aspects as a foreign correspondent for ITN and the BBC’s Panorama; as, on the human level, a confidant of leaders on both sides of the conflict, and as a participant at leadership level in the secret diplomacy of the search for peace. And his own observations are informed by his empathy with both sides: with the unspeakable but real fear of the Jews, Holocaust II: and with the anger and humiliation of the Arabs and Moslems everywhere. Hart admits in the book that he is a gentile, but describes with pride how he had the confidence of both Yasser Arafat and Golda Meir, who even described him as ‘a dear friend’. Can a Clash of Civilisations, Judeo-Christian v Islamic, be averted? The Zionism of this book’s title is Jewish nationalism, the creating and sustaining force of the modern state of Israel. And this Zionism, political Zionism, is not be confused with the spiritual Zionism of Judaism. 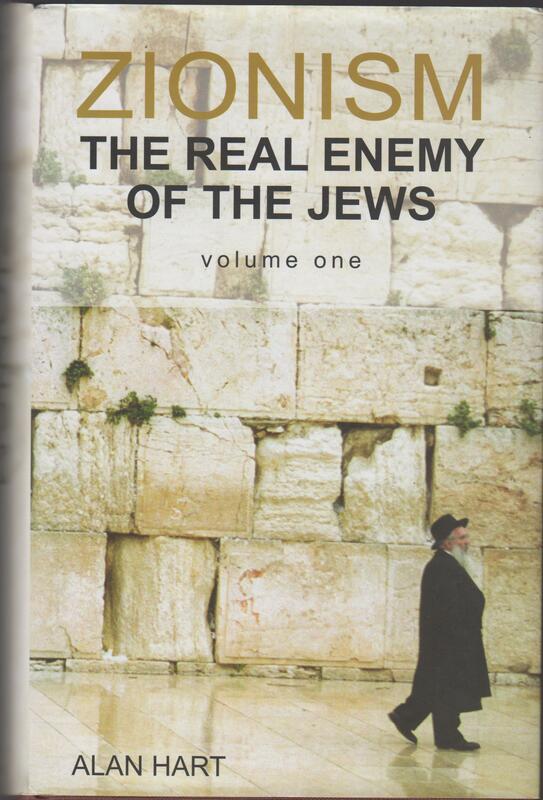 Zionism: the Real Enemy of the Jews was chosen by the author as the title for this book because, in seven words, it reflects two terrifying truths of our time. The first is that more than half a century on from the obscenity of the Nazi Holocaust anti-Semitism is on the rise again in Europe and America, where most of the world’s Jews live as citizens of many nations and as spiritual Zionists – looking upon Jerusalem as the centre of their religion and spiritual capital. The second, a great and tragic irony, is that the behavior of political Zionism’s child, Israel, where only a minority of the world’s Jews live giving substance to Jewish nationalism in action, is the prime cause of the re-awakening of the sleeping giant of anti-Semitism. The story this book has to tell – thrilling, chilling but ultimately inspirational – is a must read for all who wish to understand why, really, the countdown to Armageddon is on. And how it can be stopped. A letter to my literary agent described the manuscript for this book as “awesome… driven by passion, commitment and profound learning”. The letter concluded: “There is no question it deserves to be published.” The writer was a major UK publisher who, like others of his fraternity, was too frightened to publish this book out of fear of offending Zionism and being falsely accused of anti-Semitism. Since the obscenity of the Nazi holocaust, the false charge of anti-Semitism is the blackmail card Zionism has played, brilliantly, to prevent informed and honest debate about who must do what if there is to be a peaceful resolution of the Palestine problem, which is the prerequisite for averting a clash of civilisations, Judeo-Christian v Islamic. Why so? Because the silence of mainstream diaspora Jews on the matter of the Zionist state’s behavior had been broken. However, he soon found out that he and the others fighting for truth on this issue would have a very long way to go before achieving their goal. But it soon became clear to me that this pregnancy is going to be a very long and difficult one. After the historic IS debate I decided to delay publication of this book to give my publisher and I quality time to reach out to Jewish groups and organisations, as sensitively as we knew how, to prepare the ground for the Great Debate this book was written to provoke and promote. We learned that most Jews, because of the past, are so fearful of the future – unspeakably terrified – not just frightened – that they are frozen in silence, unable more than unwilling to criticize Israel. In my book, I have tried my best to take account of, and speak to, this fear. This passage therefore shows just how immensely courageous Jewish critics of Zionism, like Finkelstein, Pappe, Greenstein and Walker are, in defying this fear. And it also shows just as clearly how utterly wretched and despicable those would try to silence Israel’s critics by denouncing them as anti-Semites, when they are nothing of the sort, and constantly trying to invoke fears of a renewed holocaust. These are the tactics used by the Campaign Against Anti-Semitism and the Jewish Labour Movement. What we need in Israel is not a united front behind a wrong policy (continuing Israeli occupation of Arab land seized in 1967) but searching self-criticism and a careful examination of our goals and means, so that we can differentiate between realistic vision and adventurist fantasy. We need clear, rational and, above all, long-term, comprehensive political thinking… Jews in the West, particularly in the United States, should participate in this debate. They should not be squeamish and discouraged by the fear that the arguments they air may help their enemies and those of Israel. The choice facing them, as well as Israel, is not between good and bad, but between bad and worse. Criticising Israeli policies may be harmfully divisive, but refraining from criticism and allowing Israel to maintain its wrong policy is incomparably worse. If the state of Israel comes to grief (God forbid), it will not be because of a lack of weaponry or money, but because of skewed political thinking and because Jews who understood the situation did not exert themselves to convince Israelis to change that thinking. Harkabi explicitly stated that Jews around the world would be judged according to Israel’s actions, and that this would provoke an anti-Semitic reaction. As for the threat of Armageddon, he describes an interview he had with Golda Meir, who stated explicitly that if Israel was ever defeated on the battlefield, it would be prepared to take the entire region and the whole world down with it. (p.xii). He also states on the same page that the Zionists have deceived Jews and gentiles across the world into falsely believing that Israel’s existence has been in jeopardy, when that has never been the case. And he also discusses the powerful influence of the American Evangelical Christian right, and in particular a chilling speech by its leader, Pastor Hagee, which supports Zionism in the hope of bringing about the Apocalypse and Christ’s return to Earth. (p. xiii). The book is a history of Zionism and the state of Israel from its origins to Eisenhower’s 1957 confrontation with Nasser, with chapters on the Balfour declaration and ‘Zionist terrorism and ethnic cleansing’. Some of the events and documents will be familiar to readers of this blog from articles in Lobster, Tony Greenstein’s blog, the works of Norman Finkelstein and Ilan Pappe, and the material submitted by the Jewish supporters of Livingstone and the other maligned souls in the Labour party, Buddy Hell over at Guy Debord’s Cat and Mike. This includes explicit statements by the Zionist founding leadership that they were colonisers; the disgusting message by the Stern Gang offering to ally themselves with Nazi Germany in exchange for sending expelled German Jews to Israel; further statements by leading Zionists supporting the ethnic cleansing of the indigenous Arab population and the way the Israeli state used the massacre at Deir Yassin and the threat of the further violence to terrorise the Arabs into fleeing their homes. Tony Greenstein has shown again and again in his blog that Zionists will ally with real, murderous anti-Semites, just as the Stern Gang wished, when it serves their purposes. And they can be completely indifferent, even hostile to attempts to save Jewish lives if this means allowing them to remain in their native lands, or moving somewhere else in the diaspora. On page 135 Hart describes how Morris Ernst, one of the wartime leaders of the Jewish community deeply involved in attempts to rescue eastern European Jews, approached president Roosevelt with a plan to increase the number of Jewish migrants to America and Britain. He stated that, after negotiating with them, the British authorities were prepared to let 150,000 more Jewish refugees into the country. The one provision was that American must allow the same number to enter their country. Ernst looked forward to saving a further 200,000, perhaps even 300,000 Jewish lives. But he was to be severely disappointed. Under pressure from the Zionist and official Jewish organizations in America, Roosevelt had given in and decided against the plan. Jewish refugees from the Third Reich were to be sent to Palestine, not allowed into America. Ernst then went round his friends in the Jewish community to persuade them, and received a very frosty, even hostile reception. Ernst was shocked and, without mentioning what Roosevelt had said, he approached his influential Jewish friends to try to get their support for a worldwide programme of rescue. As he described it himself in his own book, this was the response he got. ” I was thrown out of parlours of friends or mine who very frankly said, ‘Morris this is treason. You are undermining the Zionist movement. '” He also said that he found, everywhere, ” a deep, genuine, often fanatically emotional vested interest in putting over the Palestinian (Zionist) movement” in men “who are little concerned about human blood if it is not their own. (p. 136). Hart goes on to explain that America’s Jews were assimilated and prosperous. They were afraid that the arrival of embittered, poverty-stricken and radical eastern European Jews would provoke an anti-Semitic reaction which would threaten their own comfortable position. (p. 36). Hart also notes that many Jews today are increasingly considering the possibility of disassociating themselves from Israel. He cites the controversy that greeted a statement by a London rabbi, David Goldberg, in 2002, when he said that it may be time for Judaism and Israel to go their separate ways. This incident perhaps explains why Netanyahu, Likud, and the other parties in his noxious coalition have passed legislation declaring all Jews, wherever they are, to be citizens of Israel. Except for those, who dare to criticize the country, no matter how mildly. They won’t be let anywhere near the country. It also provides a bit of background to the recent finding that the more American Jews, even those on heritage trips to Israel, funded by the Israeli government, find out about the Zionist state, the more they hate it. This includes even Jews, who have suffered real anti-Semitism. As, incidentally, have many of the Jews the Zionist lobby labelled as anti-Semites or self-hating Jews over here. It helps to explain the number of Jews, who support the Palestinians in the BDS movement. Clearly, a number of Jews, not just those in the anti-Zionist Naturei Karta, have been disillusioned or critical of Israel for a very long time. Certainly since the 1980s, when a number of Israeli authors first uncovered and published the evidence of Israel’s horrific crimes against the Palestinian people. And the movement is growing. It’s because of this that there’s a bi-partisan movement in Congress to criminalise as anti-Semitic protests against Israel and the BDS movement. According to RT’s report, the proposed legislation will include a maximum sentence of 20 years in prison. Meanwhile, real anti-Semites and neo-Nazis, including some of the denizens of the Alt-Right in Trump’s own administration, are allowed to continue spouting their own hate, including holocaust denial, because free speech is protected under the Constitution. Well, it is, so long as it doesn’t threaten Israel and by extension, western power in the Middle East. The book is a savage indictment of Zionism and its supporters in America and Europe, including the leading politicians in Britain and elsewhere, that promoted the country as a means of advancing their own global, imperial interests. And it shows that Zionism is not only dangerous for provoking anti-Semitism, but also that Zionists – both Jewish and gentile – will also use anti-Semitism as a weapon to ensure further Jewish emigration. The Zionists have shown that they can be just as ruthless and persecutory towards ordinary, diaspora Jews, as towards the Palestinians and other Arabs. This is a book that desperately needs to be read by more people, if a genuine, just peace is to be established in the Middle East. And it is also extremely useful in combating the lies, slander and bullying of the Israeli lobby in British politics, including the Labour party. Mike also put up a couple of pieces yesterday critiquing and criticising a piece by Heidi Alexander in Friday’s Graun claiming that she resigned from her post as Shadow Health Secretary because Jeremy Corbyn was constantly undermining her and going behind her back. He does so by pointing out the inconsistencies between her tale, and what she actually said at the time. For example, in her article she talks about how delighted she was to receive Corbyn’s invitation to take the post. Yet at the time, he was also in the Daily Mail saying she would not back Corbyn, because he was ‘unelectable’. She then claims that she left the Shadow Cabinet because it was ‘chaotic’ and ‘entirely dysfunctional’. But the real reason was that she was profoundly ideologically opposed, no matter what she says about interesting bright people committed to the NHS and giving Jeremy Hunt a run for his money. John McDonnell was suspicious of her. She wasn’t doing enough to support the junior doctors, nor to combat Jeremy Hunt’s Seven Day NHS policy. So he set up an advisory panel to look into her work. She claimed that she supported this, but wasn’t informed about it. When she found out, she quit. Others involved in the affair have quite different versions of events. Mike makes the point that it’s not pleasant having someone else scrutinise your work, but we’ve all had it done to us. It’s part of business. You also have it in academia and in publishing. If publishers think a book you’ve written needs some alterations, they tell you. This includes tenured academics writing technical papers for academic publications. Mike states that it’s significant that the advisory panel hadn’t met before she left. Mike also makes the point that she was among the first to resign following Hilary ‘Bomber’ Benn. He also points out that it’s hard to take her complaints seriously when she starts claiming that she wasn’t part of a coup, nor a plotter. She clearly was. As for her claim that Corbyn’s election would cause division, that’s exactly what she and the other Blairites have done. She states that when Labour members receive their ballot papers on Monday, they should carefully consider who would best lead the party. She now supports Owen Smith, yet Smudger had not put himself forward when she walked out. Mike concludes that she’s simply a two-faced co-conspirator, who simply wanted Corbyn out so that she could further her own ambitions. Following Heidi Alexander’s self-pitying moan in the Groaniad, the NHA – the National Health Action party put up a piece, ‘Bye Bye Heidi’, welcoming her resignation. They state that they were hoping she’d resign, as she fully supported Simon Steven’s 5 Year Forward Plan for the privatisation of the NHS. The article quotes Dr Bob Gill, one of the executives of the National Health Action party, who met her twice. She said to him I believe Stevens has the best interests of the NHS at heart’. He goes on ‘A former UnitedHealth president here to complete the transition to an American style insurance system has her confidence. That says it all.’ She did not appear on junior doctor picket lines, nor even wear a BMA badge. He hopes that now that Blairites like Alexander are leaving the cabinet, Corbyn can appoint people, who actually want to renationalise the NHS and fully understand that it doesn’t have to be the private industry Hunt and Stevens want. He states that the hospital closure plan is ready to be implemented. Hospitals and Accident and Emergency services are ready to be closed to pay off NHS debts. Dr. Gill states that Labour ought to be shouting from the roof tops about this. And with the right MPs in charge, may be they will. I think the National Health Action party has more than a little experience of dealing with privatising Blairites. I’ve got a feeling it was begun, at least according to Private Eye, when Blair tried to close a popular local hospital in the Midlands – I think it might have been Warwickshire, but I can’t be sure – in favour of a PFI deal. Local people and medical professionals tried to get their local councillor or MP to challenge the policy. They didn’t get very far, so one of the doctors stood as the party’s candidate. He won, defeated the Labour incumbent, and Tony got very cross. In fact, much of the legislation the Tories have taken over and built on as part of their plan to privatise the NHS was started by Tony Blair, who wanted to remodel the Health Service on the type of ‘managed care’ practised by Kaiser Permanente and other American medical insurance companies. Hence I’m not remotely surprised by her comments about Stevens, an officer from an American insurance company, being placed in charge of the NHS’ privatisation. The Blairites are disgusting, and the support of the supposedly left-leaning Groaniad for them, and by extension the privatisation of the NHS, is equally revolting. The time’s long past they were banished from the Labour party and national politics for good. I am planning to crowdfund a book about economics. The working title is “The history and future of currency” – but I’m hoping to think up something a little more catchy before publication. The essence of the book will be the importance of money in economic systems, and how redesigning money itself could break the tired old left-right paradigm that has utterly dominated political and economic discourse since the 19th Century. There are two main reasons I have decided to crowdfund the project. The first reason being that I am keen to crowdsource as much of the project as possible in order to turn it into a collaborative project. Perhaps you could think of it as a kind of open peer review, in which a wide range of people are invited to offer their feedback as the book is being written. The second reason is that I really want to ensure that my book goes into physical print. I will of course do an ebook too, but I feel it is incredibly important to create a physical book so that my work is accessible to those that rarely/never use computers, electronic readers or the Internet. I don’t want my book to be something that just exists in the digital space, if I wanted that I could just write what I’ve got to say in the form of blog posts on this page. He also states that he intends to produce a short video laying out his reasons for starting the project. Economics isn’t the most riveting of subjects. There’s a reason why it’s been called ‘the dismal science’. The Angry Yorkshireman, however, is certainly very well informed about the subject. He has described the Coalition’s economic policies as ‘economically illiterate’, and produced some extremely well-argued, concise and readable posts to support this. His posts on economics are always worth reading and I’ve learned a lot from them myself. There are already books on the history of economics. One of these is The Penguin History of Economics by Roger E. Backhouse (London: Penguin 2002). Unfortunately two of the most recent studies of the subject have both been written by men of the Right: Niall Ferguson’s The History of Money, and Vince Cable’s The Future of Money. It seems to me that the book’s suggested title, The History and Future of Currency, suggests that the Angry One is planning it partly to challenge the ideas of those two, and their support for destructive Neo-Liberal economic policies. And that certainly is no bad thing. The article is entitled ‘The History and Future of Currency: Rewards, and is over at http://anotherangryvoice.blogspot.co.uk/2014/03/the-history-and-future-of-currency.html. Please go there for further information, including his proposed schedule for various levels of funding and to what that will get you in return.